Fashionlook online is the only legal owner of this LESHP 5inch GPS Navigation on Amazon. When you power on our GPS navigation the screen will show our brand name "LESHP",however, if you buy it from other sellers' it won't show our"LESHP"brand on your GPS navigation. Fashionlook takes full responsibility of this LESHP 5inch GPS Navigation. Please pay attention to check the name of seller store in case of buying counterfeit and fake product. 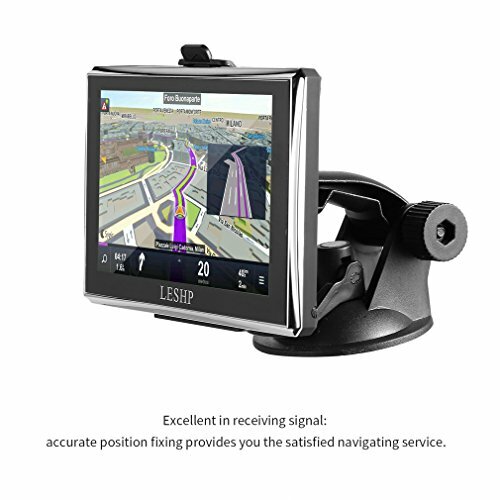 We found other sellers sell a "LESHP" GPS Navigation at a very low price! These sellers will take your money and not send you the product, Or just send you a poor quality fake product to you. Be careful! The screen resolution is 800 * 480. Entertainment functions: mp3, mp4, mp5, digital photo frame, e-book, FALSH, game. If you can not use navigation or have returned to factory settings,welcome to contact us.We will try to help you solve the problem. EASY TO USE:LCD Touch Screen,Comfortable user interface, simple, easy to operate, Includes sturdy suction cup mount for easy adjustment and quick release.PLEASE ATTENTION:Fashionlook online is the only legal owner of this LESHP 5inch GPS Navigation on Amazon. We found other sellers sell a "LESHP" GPS Navigation at a very low price! These sellers will take your money and not send you the product, Or just send you a poor quality fake product to you. Be careful!